While broadly classed as a sniper’s weapon, the Dragunov was meant to increase the effective firing range of a motorized rifle detachment to 600 meters, extending the 400-meter reach of the AK47. In service for 50 years with the Soviet and Russian armies, the Dragunov (Sniperskaya Vintovka Dragunova – SVD) may today be faulted for the limitations of its sights or long range shot deviation. But a true marksman will have an inherent respect for this veteran design that still bolsters the firepower of 26 countries, and has blazed its deadly trail through most world conflicts since the 1960s. Like the Kalashnikov assault rifle, the Dragunov was named after its inventor. While broadly classed as a sniper’s weapon, it was meant to increase the effective firing range of a motorized rifle detachment to 600 meters (656 yards), extending the 400-meter (437-yard) reach of the AK47. The SVD has a high probability of hitting a head-sized target at 300 meters (328 yards) with one shot, and a chest-sized target (50x50 cm) at 600 meters (656 yards). Its designers were, however, pulled in two directions. While the weapon had to provide a high degree of accuracy, it needed to be reliable and robust enough for field conditions. The resulting cruder assembly of the SVD’s parts came at the expense of shooting precision. Intended for use not by professional sharpshooters but by 18-year-old conscripts fresh out of school, it also had to be semi-automatic, offer a decent rate of fire, and be easy to use. It was Yevgeny Dragunov, a specialist in sports weapons from a long family line of gunsmiths, who won the design competition, beating out Mikhail Kalashnikov’s AK47-based model. The SVD was one of the first purpose-built sniping weapons, incorporating revolutionary features like a sports rifle buttstock fitted with a pistol grip, a detachable cheek rest, a PSO-1 reticule optical sight with side-scales for adjusting range and elevation, and an extendable scope shade and light filter. And as an infantry weapon, the rifle also came with a bayonet. As well as being highly accurate, the rifle had a light and compact configuration, was capable of semi-automatic firing and operated well in any climatic conditions. Compared with conventional bolt-action sniper rifles that might manage five aimed shots a minute, the SVD could fire up to six times more. It uses specially made steel core bullets but can take the entire range of Soviet/Russian 7.62x54 mm cartridges. All in all, it was a top performer with a reputation to match. The SVD also “enjoyed a certain amount of mystique with U.S. buyers, due to its styling and relative rareness in the country,” the U.S. website Guns Holsters and Gear wrote on the rifle’s 50th anniversary. But rare as the SVD is in the United States, it is well known to U.S. troops serving in conflict zones overseas. In Afghanistan, the Dragunov helped save the day on October 3, 2009, when U.S. Staff Sergeant Clinton Romesha picked up a rifle that had been dropped by an Afghan soldier during an attack by some 300 Taliban insurgents in Nuristan Province. Through a combination of training, courage and the SVD’s high sighting range and rate of fire, Romesha took out an enemy sniper and a machine-gun position and then three more fighters who had infiltrated the U.S. positions. He was awarded the Medal of Honor for his actions. In trained hands, the SVD can be devastating for aircraft too. In 1989, a guerrilla fighter in the civil war in El Salvador used one to bring down a government Cessna jet attack aircraft by killing the pilot. The need for sniper capacity among infantry units prompted the Pentagon to develop an equivalent, the M110 Semi-Automatic Sniper System (SASS). Built 44 years later, it has numerous technical advantages, including improved optics. But overall, the accuracy is almost the same as the SVD and the M110 is even inferior in some characteristics. But the Dragunov has not rested on its laurels. A shorter folding SVD was issued to Soviet forces in Afghanistan in the 1980s. In the early 1990s a faster loading version of the SVD was produced and issued mainly to Russian interior ministry forces. 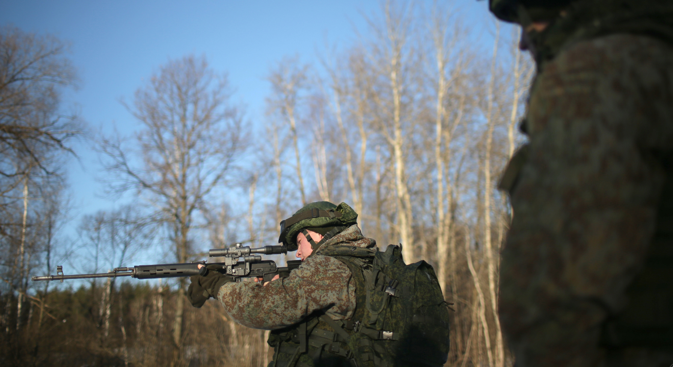 And in 2006, the Russian Army adopted the 9 mm SVDK semi-automatic sniper rifle. Today, Yevgeny Dragunov’s son Alexei continues the work of the family dynasty. He believes sniper rifle development now will tend not toward range and caliber but rate of fire and loading efficiency. "Automatic loading gives the SVD the edge, maintaining its popularity in the military through close-range fighting capacity,” he says.